You might be familiar with some elements of the Miyako Odori dance from the movie Memoirs of a Geisha, although the acting in that film was more wooden than all the buildings in Gion and with a fight sequence that Dynasty would have been proud of. In any case, the scene in which Sayuri performs her unusually interpretive Snow Dance looks to me like it was filmed in the Kaburenjo Theatre where the Miyako Odori takes place. Ignore that slightly OTT Snow Dance though, because the performance you see is much more traditional as shown in the video highlights below, shared via the Miyako Odori Twitter feed. Booking tickets for the show is pretty straightforward, but do it early since there is a lot of demand. Ask your hotel concierge, or use the booking form on the website. There are four performances a day which last an hour. The basic ticket with allocated seating costs around 4,200Y, but I would recommend choosing the ticket that combines the performance with the tea ceremony since it adds greatly to the overall experience and it doesn't cost that much more (4,800Y). Arrive well before your appointed performance time, because the ticket gives you entry to the stunning gardens in the inner courtyard of the theatre. I could have spent much more time here investigating the ancient trees, but the performance was drawing near. After wondering around the gardens, join the queue for the tea ceremony. The ceremony lasts hardly 5 minutes (it has to be a fairly rapid turnover to get the 1,000 or so people into the theatre on time for the start of the performance), but at least it's a quick glimpse into the tradition. We happened to be at the front of the queue when our group of probably 80-100 people was ushered into the chamber where the ceremony takes place and took our seat on the front table. We were served a small sweet red bean treat and watched the graceful tea preparation. You get to keep the cute little plate that the wagashi is served on too. Part of the ceremony involves serving tea to the first woman and the first man in the front row. As I mentioned, we were on the front table and I happened to be the first man in the row, so I was a little surprised when this happened. Perhaps if you're on one of the tables towards the back of the room or to the side, the experience will not be as impressive, but I snapped some great pics and was surprised at the personal attention I received. As you move on from the ceremony, you'll pass through a museum with a stunning kimino exhibition before hitting some stalls selling souvenirs and then entering the theatre itself for the performance. The whole show lasts about an hour and although I didn't really understand exactly what each scene was about, I was mesmerised by the choreography, the beautiful kimono, the instrumentation and stage production with its impressive lighting and backgrounds. No photography is allowed inside the theatre, so sit back and be transported to old Kyoto. After the performance, you'll be in need of somewhere to recap what you've just seen and I've got two suggestions quite nearby. 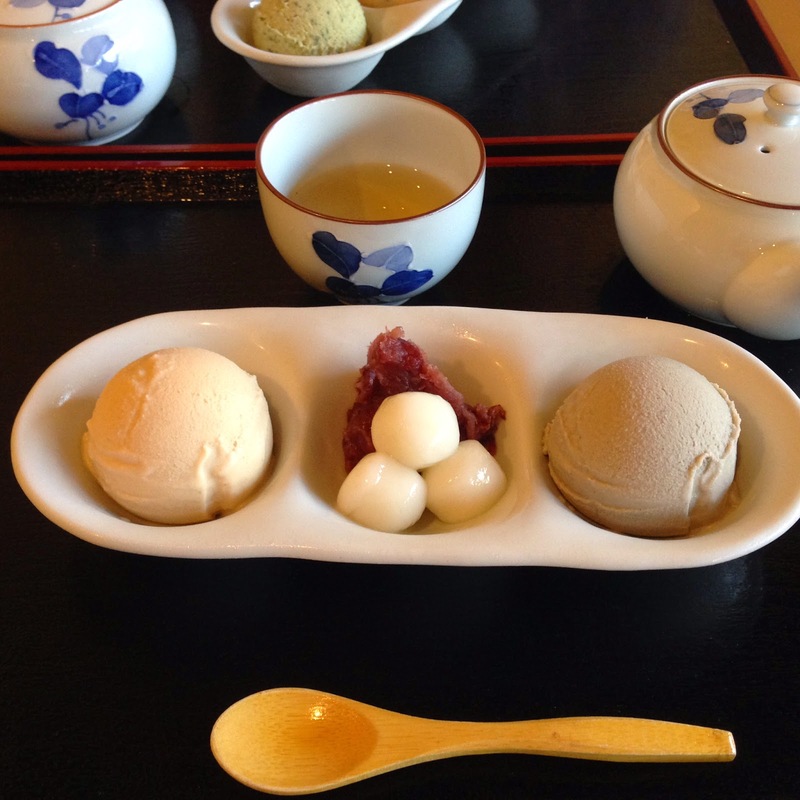 The closest is Kinana (祇園きなな), which serves some of the best ice cream in Kyoto. It's located on one of the back alleys near the theatre barely five minutes walk away (address: Japan, 〒605-0074 京都府京都市 東山区祇園町南側570−119). Although there is no English signage, the understated entrance looks like this. Upstairs is a small seated area serving interestingly flavoured scoops of the smoothest ice cream or a more decadently constructed parfait. I chose brown sugar, caramel and mugwort (800Y) ice cream. Although not exactly cheap, it was a nice break from the crowds and gave us time to savour the Miyako Odori performance. There's also an option for just two scoops with some mochi for 700Y. A little further walk away on the Shijo Dori is Kagizen Yoshifusa (address: 京都市東山区祇園町北側264番地), which is a little more zen-like than Kinana and serves a wide selection of more refined wagashi. Tucked away beyond the dark wood counter selling takeaway treats, is a tea house which looks onto a small enclosed garden. I ordered kanro-take, which is a jelly (mizu-yokan) served in a small bamboo shoot. It's essentially red bean jelly, and quite beautiful, even if it does look like a lipstick. But the prettier dish was the stunning sakura wagashi.With the beautiful light streaming in from the garden, Kagizen is a perfect pit stop on your tour of Gion whether you've been to the Miyako Odori performance or not.